The interactive tool from which this simple graph is taken lets you compare basic demographic data from 2001 and 2011 at a variety of different scales. It’s fantastic if you want to see which places or age bands are growing and which are not. Why, you might well ask, would a historian be interested in population change as recent as this? Well, for starters, you might be interested in looking for echoes of the past in the current population. Look, for instance, at the little bulge of people in the population pyramid aged 60 to 65. These are the baby boomers, born in a time of post-war fertility catch up as well as rapid economic and social change. In the past ten years, they’ve moved out of the working age population and into retirement…at the same time as our economy has faltered and found the cash to support them ever harder to come by. The history of the baby boom is very far from over. If that’s whetted your appetite for demographic history in the twentieth century (or, at least, the bits of it that the census can get at), take a look at this rather splendid story of the census. Population pyramids have never been so exciting. 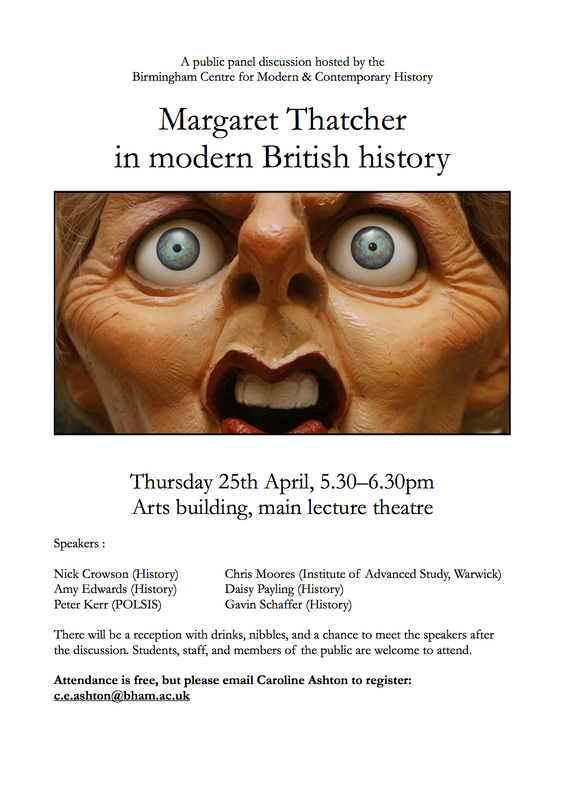 For our public event on Margaret Thatcher in modern British history, click here. 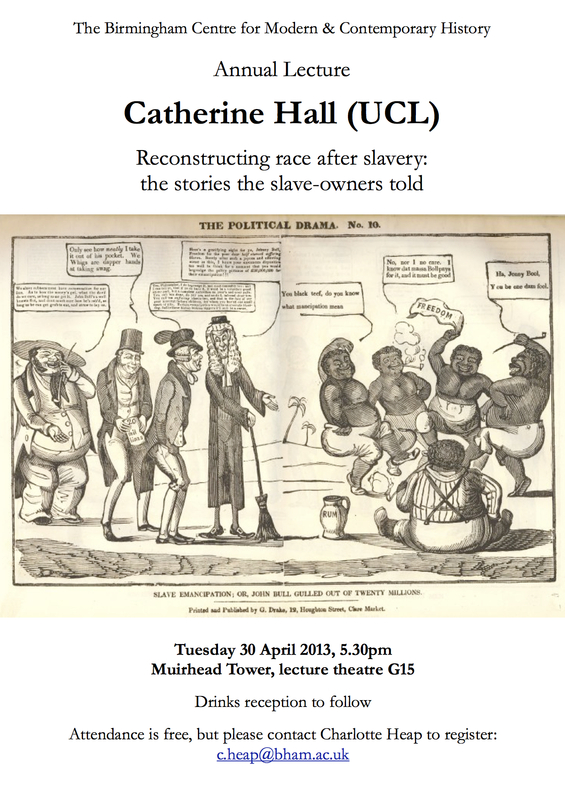 For our annual lecture by Catherine Hall next week, click here. Update: my colleague Matthew Francis rightly points out that a revolution that happened in 1974 can’t be celebrating its thirty-fifth anniversary in 2013. Perils of doing a blog post late at night—apologies. Thursday 25 April is the anniversary of the ‘carnation revolution‘ in Portugal: something of a historical rarity, as a military coup that overthrew a dictatorship and replaced it with democracy. (The army, largely made up of conscript soldiers, was sick of fighting pointless and unwinnable wars against anticolonial nationalist movements.) To commemorate the anniversary, here are some pictures of the events in Lisbon. Professor Thomas Pogge will be giving a talk at the University of Birmingham on Friday 10 May. 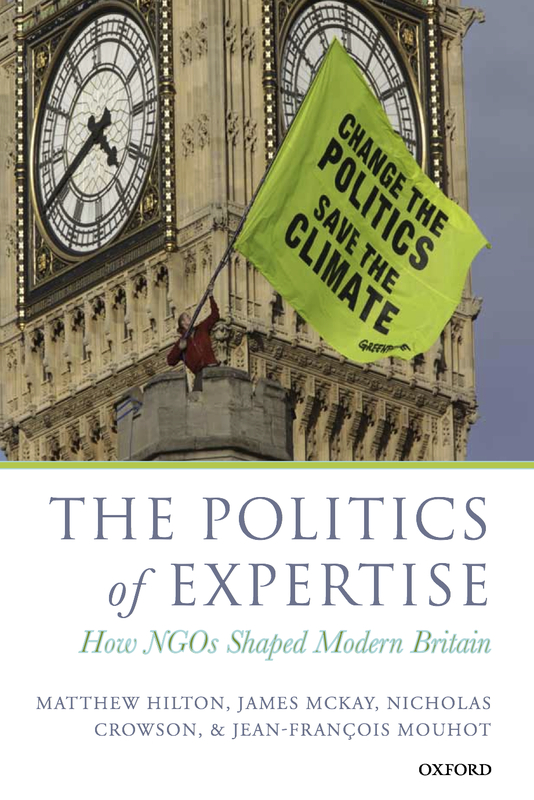 Professor Pogge is one of the leading experts on global ethics. He is the Leitner Professor of Philosophy and International Affairs at Yale University and also the director of the Global Justice Programme at Yale’s MacMillan Centre. 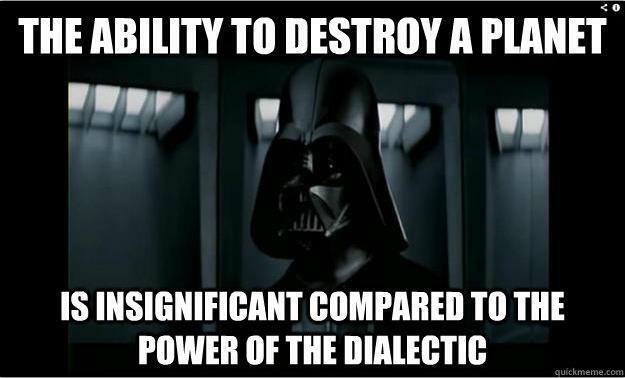 His recent books include John Rawls: His Life and Theory of Justice (OUP 2007), World Poverty and Human Rights: Cosmopolitan Responsibilities and Reforms (2nd ed., Polity 2008), and Politics as Usual: What Lies Behind the Pro-Poor Rhetoric (Polity 2010). This event has been organized by Academics Stand against Poverty‘s Birmingham group and the Birmingham branch of the Giving What We Can project. The talk will be followed by an interview of Professor Pogge by the students and wine will be served after the Q&A. The location of the talk will be announced later. You can get more up to date information at the Centre’s events page, or contact Simon Jenkins for details. Margaret Thatcher is being buried today, and the heated arguments about the funeral itself demonstrate that opinions about her are as divided as ever. 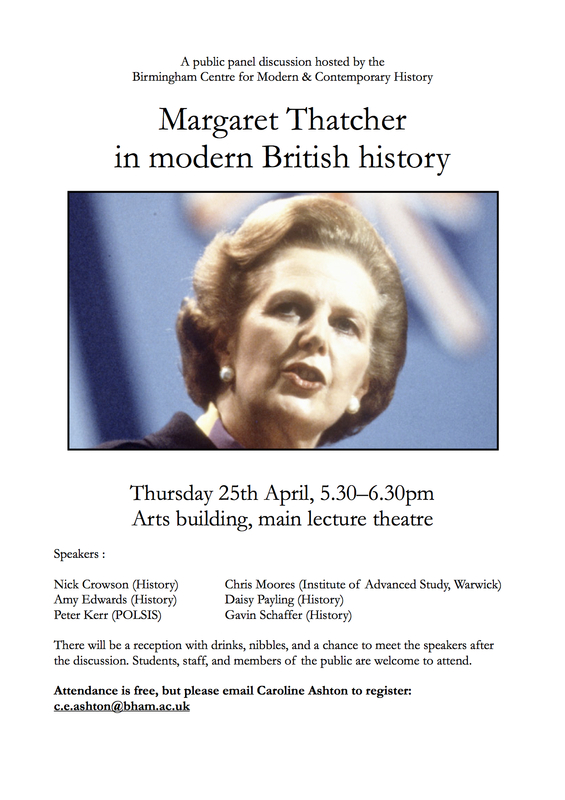 In response to the significant public interest in her life and legacy—much of it from people too young to remember her time in government—we’ve organized a public event for the first week of the summer term: a panel discussion on Margaret Thatcher in modern British history. It takes place on Thursday 25 April, 5.30–6.30pm, in the large lecture theatre of the Arts building (R16 on the campus map). A range of speakers will each give a short talk on Margaret Thatcher’s place in their own fields of research: these include histories of race and immigration, social activism, and culture, as well as work on party politics. There will then be an open discussion with questions from the floor, followed by a reception with drinks, nibbles, and a chance to meet the speakers. The event is open to all: students, staff, and members of the public. Attendance is free, but please register by emailing Caroline Ashton (c.e.ashton@bham.ac.uk). 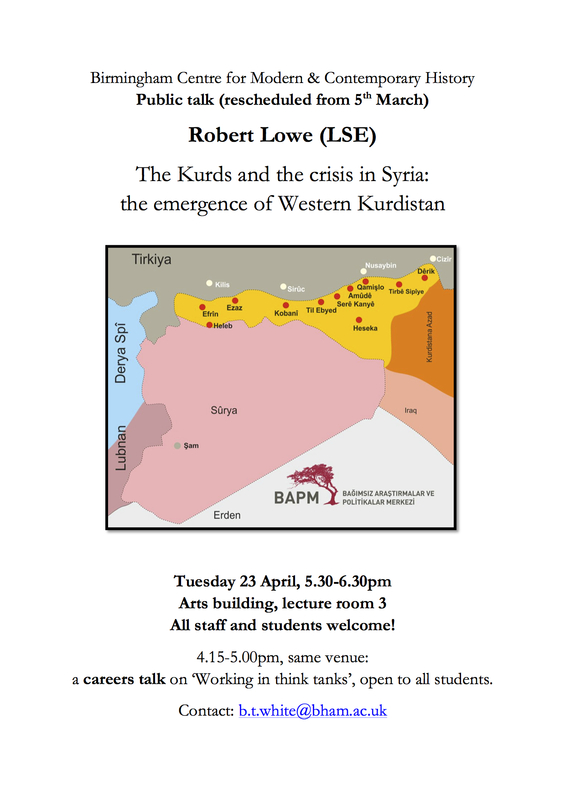 Our public talk on ‘The Kurds and the crisis in Syria: the emergence of western Kurdistan?’, by Bob Lowe of the LSE, postponed from last term, has been rescheduled for Tuesday 23 April (that’s Tuesday of week 1). The amended poster, with new venue details, is below. The careers event for students on working for think tanks will also be taking place earlier in the afternoon. Also, watch this space for details of another topical event on Thursday of week 1.